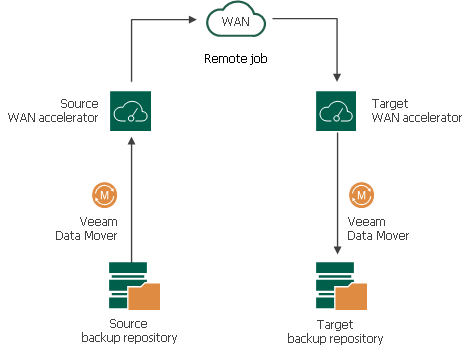 For WAN acceleration, Veeam Backup & Replication uses dedicated components — WAN accelerators. WAN accelerators are responsible for global data caching and data deduplication. Technically, WAN accelerators add a new layer in the backup infrastructure — between the Veeam Data Movers on the source side and the Veeam Data Mover on the target side. To enable WAN acceleration and data deduplication technologies, you must deploy a pair of WAN accelerators in your backup infrastructure. One WAN accelerator is deployed on the source site, closer to the source backup repository or source host. The other WAN accelerator is deployed on the target site, closer to the target backup repository or target host. The VeeamWAN folder on the source WAN accelerator stores files with digests required for global deduplication. For more information, see How WAN Acceleration Works. The VeeamWAN folder on the target WAN accelerator stores global cache data. To create a WAN accelerator, you need to assign the WAN accelerator role to a specific machine. You can even assign the WAN accelerator role to the existing backup proxies and backup repositories. On each WAN accelerator, Veeam Backup & Replication installs the Veeam WAN Accelerator Service responsible for WAN acceleration tasks. The WAN accelerator can run on a physical or virtual machine. The WAN accelerator can run on a 64-bit Windows-based machine. The machine must have enough free disk space to store digests or global cache data. For more information, see WAN Accelerator Sizing. You should not assign one source WAN accelerator to several remote jobs that you plan to run simultaneously. The source WAN accelerator requires a lot of CPU and RAM resources, and does not process multiple tasks in parallel. As an alternative, you can create one remote job for all VMs you plan to process over one source WAN accelerator. The target WAN accelerator, however, can be assigned to several remote jobs.